1) The black spot on the forewing is clearly marked. It is not so obvious in the Common Blue. 2) The orange lunules on the forewing are clearly marked - not conclusive in itself. As they aren't strong right to the front of the wing this is a male Brown Argus. 3) No obvious white in the orange lunules on the hind wing. 4) There are clearly marked continuation of the veining into the white fringes of the wing (like Adonis Blue). 5) There is no evidence of blue in the wings. The slight bluish tinge in the hind wing doesn't count. 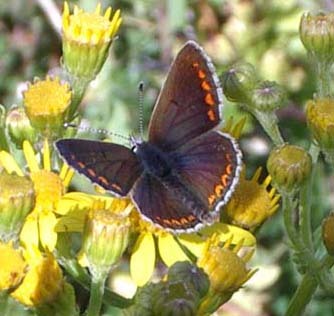 This iridescence is common in the blues and can be seen in Small Coppers too, depending on how the light catches them. 6) Size. Judging from the ragwort flower it looks about the right size. Although there isn't much in it size wise. You've snapped this one right at the start of the second brood, so it's in rather good nick. Keep and eye out for more as the second brood should be around for the whole of August. 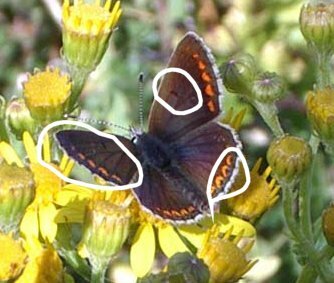 1) On the underside hind wing of the Brown Argus two of the spots line up to form a colon ':' (See A on the picture), whereas on the Common Blue the second spot is in line with the rest of the spots that follow the shape of the wing (See B on the picture). 2) If the underside of the forewing is exposed enough, then the Common Blue has spots closer to the body than the mid-wing elongated spot (See E on the picture). 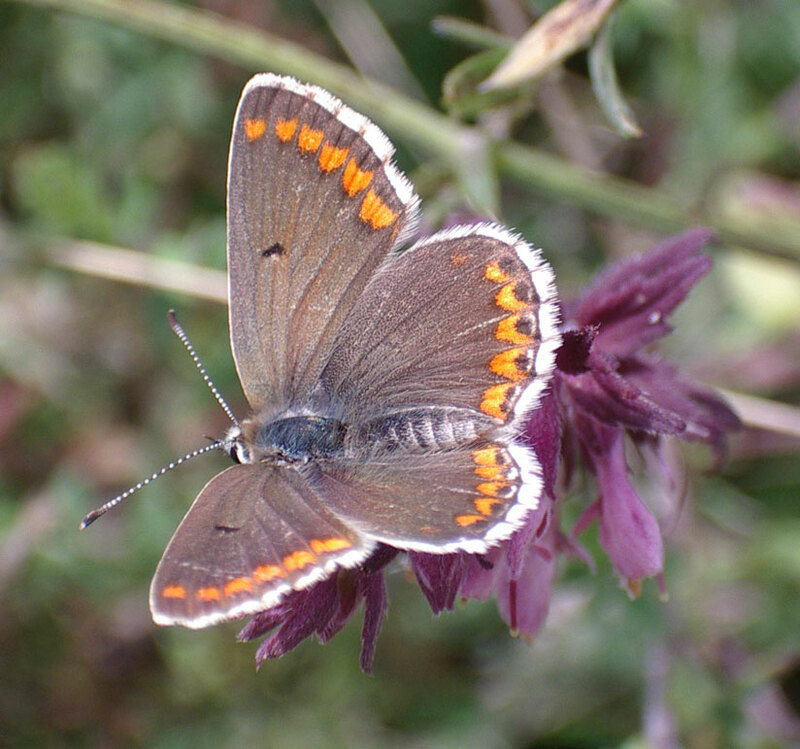 The Brown Argus does not have these, but that part of the wing is rarely exposed. 3) On the upper wing the mid-wing spot is either not visible or not very prominent in the female Common Blue (See C on the picture). 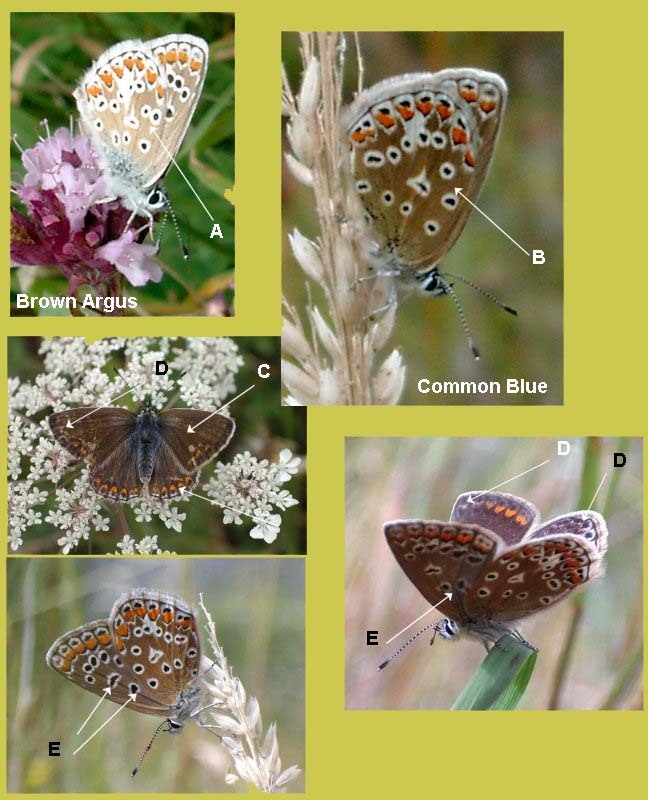 4) The female Common Blue has prominent areas of white on the upper wing that is not present on the Brown Argus (See D on the picture).